A federal judge on Thursday denied a request that sea lion trapping below the lower Columbia River's Bonneville Dam be forestalled while newly filed litigation plays out. But U.S. District Court Judge James E. Boasberg's denial of the request for a temporary restraining order did alter the rules for the planned lethal removal effort. He said the federal authorization to the states of Idaho, Oregon and Washington will be limited to the lethal removal this year of 30 California sea lions, none of which may be killed by shooting. "Such limitation will apply during the pendency of the case or until further Order of the Court," the judge said. The authorization approved March 15 by NOAA Fisheries would allow for the removal of up to 92 California sea lions and the use of firearms as a removal tool. Federal and state officials have said they don't believe it is likely they could trap more 30 animals a year. The removal is only allowed of animals that have been specifically identified as preying on protected salmon and steelhead in the waters below the dam, which is located at river mile 146. The states say that sea lion predation below the dam and elsewhere in the river is countering to some degree expensive efforts being taken to improve fish survivals and move toward the recovery of salmon and steelhead that are listed under the Endangered Species Act. The Humane Society of the United States has maintained, now and in related litigation dating back to 2008, that sea lions are natural predators and kill fewer fish than other legal causes of mortality like fishing and the operation of the hydro system. The HSUS also says that sea lion removals won't help because more marine mammals will flock to the dam to replace the fallen creatures. It is believed that historically only a few California sea lions traveled up the river each year to feast on salmon spawners below the dam as they search for the fish ladders. But shortly after the turn into this century the number of California sea lions that gather below the dam each spring grew. The peak count of "individually identifiable" California sea lions below the dam was 104 in 2003, according to U.S. Army Corps of Engineers researchers at Bonneville. 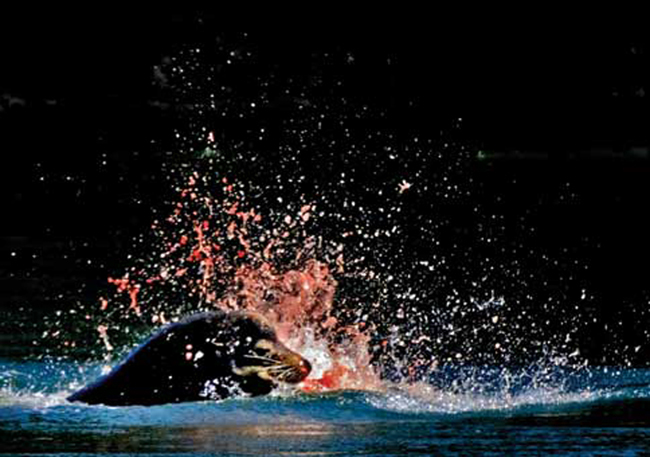 The research, started in 2002, aims to evaluate pinniped impact on salmon. Last year's CSL count was 54. NOAA Fisheries first approved a state application for lethal removal authority on the Columbia River in 2008. Between 2008 and 2010, amidst numerous legal skirmishes, a total of 38 California sea lions were removed, including 10 that were placed in zoos or aquariums. Most of the animals captured in floating traps were euthanized by injection. None were shot. The HSUS, Wild Fish Conservancy and two individuals were ultimately successful in their legal challenge. The 2008 lethal removal decision under the Marine Mammal Protection Act's Section 120 was declared illegal in 2010 by the U.S. Court of Appeals for the Ninth Circuit. NOAA Fisheries received a second Section 120 application from the states last year and in May 2011 issued an approval the agency said fixed the legal flaws noted by the appeals court. But, with litigation ongoing, the agency opted in July to revoke the 2011 lethal removal authorization. The states in August filed a third application and NOAA announced its approval of the plan March 15. The authorization under Section 120 became effective on March 20 and is designed to stay in effect until the end of May 2016. HSUS on March 20 - the day the sea lion removal program was slated to begin - filed a complaint and request for preliminary injunction with the U.S. District Court in Washington, D.C. Two days later the organization filed the request for a temporary injunction that would prevent lethal removals in the near term. The complaint asked that the NOAA decision should be vacated because it violates the MMPA, the ESA and the National Environmental Policy Act. The states and federal government agreed to postpone implementation until the TRO request could be debated in court. Boasberg convened a hearing on Thursday morning on the issue and issued his order later in the day. The request for a temporary restraining order said that the plaintiffs would be "irreparably harmed if these federally protected animals are killed simply for eating fish before such time as the Court can resolve Plaintiffs' request for preliminary injunction after briefing by all parties. "Therefore, in order to simply preserve the status quo and to prevent irreparable harm to Plaintiffs if federally protected sea lions are unlawfully killed, plaintiffs ask that the Court issue the requested restraining order," HSUS said. "Further, even if the agency is correct, and this is an extraordinary case where federally protected native wildlife must be killed to protect other federally protective wildlife, that conclusion should be given at least some modicum of judicial review before being irretrievably executed on the ground." The sea lions, males that wander north from California and Mexico to forage following their breeding season, have not arrived at the dam in any large number yet. Through Wednesday only seven individually identifiable California sea lions had been spotted at the dam so far this year, including five on one day. Of the seven, five have been seen feeding at the dam in past years.